It can be a little difficult to tell what your parakeet is feeling, especially when you are a new parakeet parent. There are a few physical “tells” that will let you know if your parakeet is anxious or scared, which they frequently are in a new environment, or even after years in your home because of their instincts as prey animals. Being able to tell when your parakeet is afraid can help you know when to back off and give them space. Remember taming your parakeets is not a sprint, it’s a marathon! Flapping/flying like crazy around their cage. This will probably happen the first few times you put your hand in the cage. Unless your new friend was hand-raised he probably views your hand as a terrifying predator. If this is the case I recommend only going in the cage for essential maintenance in the beginning, and otherwise spend a lot of time showing your parakeet your hand from the other side of the bars. Let them examine it from a safe distance without you moving your hand. Offer millet through the cage bars once they are able to tolerate your hand being close to the cage without fear. Panting is another indicator of a fearful parakeet. Kelly still does this occasionally but it was much more frequent when she first came home. A panting parakeet breathes with their beak slightly open. It may look “cute” or like they are trying to speak, but no sound comes out. If you have a clipped parakeet who pants when they are out and about with you they are overwhelmed and would probably like to go back to the safety of their cage. Fear poops: A fear poop is a very watery poop that doesn’t have another explanation like just having taken a bath/eating a lot of veggies or being ill. These are frequently very easy to ascertain the cause of, if I disturb Kelly during an afternoon nap she fear poops right away. The watery fear poop should happen one or two times in a row, and then normal poops will resume once they are over being startled. Very sleek feathers and wide eyes. This is more Toby’s style. If she’s startled by something all her feathers get very very flat and she will stand up at attention with her eyes wide open. She also goes to one of what we call her “fear spot” in the cage; which is randomly on the cage wall next to one of the water bottles. She stays there until she feels the danger has passed. You may never be able to tell what scared your parakeet in the first place. Many times I think mine are set off by things they see or hear outdoors through a window, but I’m not sure. Other times it’s the cord on the vacuum, or even my husband or I appearing somewhere unexpected. They got really freaked out the other day when I came home through the “wrong” door. But, if you’re watching for the signs of fear you can at least know when something has already spooked them, and help them get back to their cage if needed, or try to pinpoint the cause of their concern and eliminate it for them. 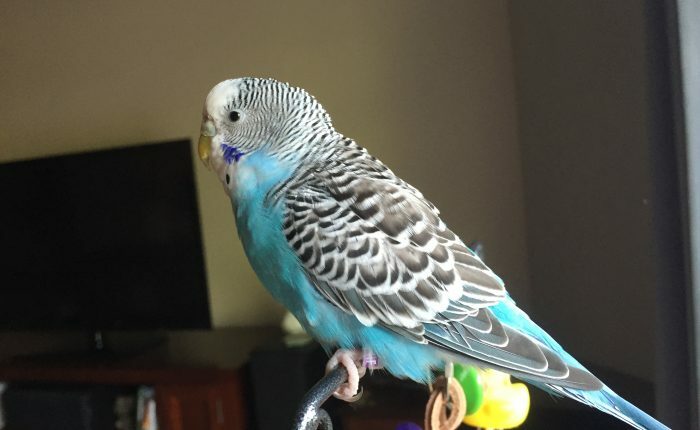 Previous Previous post: Where should you get your first Parakeet?